This book explores some of the developments in Stylistics since its pioneer, Roman Jakobson identified the patterning of the message as the poetic function. It analyses in turn Golding’s Pincher Martin, Rowling’s Harry Potter and the Philosopher’s Stone, Housman’s A Shropshire Lad, Elizabeth Jennings’ poem ‘One Flesh’, Harold Pinter’s The Birthday Party, Ishiguro’s The Remains of the Day, and a range of poems by John Donne. The analyses show how Jakobson’s emphasis on the message gives way to emphasis on the code or on undermining the code (in the Golding and Donne chapters), on the context (in the Rowling and Golding chapters), on the reader’s response (in the Housman chapter), on the relationship between the addresser’s and the addressee’s shared assumptions and their use of pragmatic principles (in the Pinter and Ishiguro chapters). The pivotal Jennings’ chapter shows how these different stylistic perspectives can be applied variously to the same text. 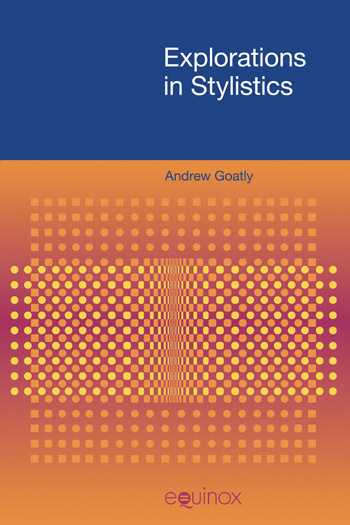 This collection of essays will be especially useful for students of Stylistics courses at the undergraduate and graduate level as it illustrates the use of a range of analytical tools: Systemic Functional Grammar’s analysis of transitivity and theme; pragmatic theories of co-operation, politeness, presupposition and inferencing; and conceptual metaphor theory. Additionally it demonstrates central stylistic concepts such as foregrounding, and how to analyse rhythmical, lexical, grammatical and semantic patterning.